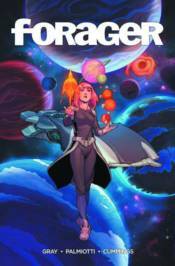 An all-ages sci-fi adventure from bestselling writers Jimmy Palmiotti and Justin Gray and breakout artist Steven Cummings (Wayward)! In an attempt to save their crumbling marriage, Glenn and Joan Travers take their six-year-old daughter Ellie, on a week's vacation aboard a luxury Star Liner orbiting the Earth and Mars. Soon after reaching orbit, Ellie begins hearing voices from what she calls angels, claiming they are, 'coming for our world.' As the days pass, Ellie alarmingly slips in and out of a catatonic state for short periods of time, each time explaining that the angels are getting closer. Are the angels real? Is Ellie suffering a mental breakdown? Or are we about to make first contact with an alien intelligence? Featuring a pin-up by Darwyn Cooke!